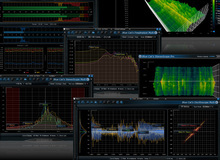 ToneBoosters has released EBU Loudness, a new stereo and multi-channel loudness measurement plug-in compliant with EBU R-128, EBU TechReport 3341 and EBU TechReport 3342.
zplane announces the release of version 3 of the metering plugin PPMulator in the second quarter of 2011. Faber Acoustical has announced the release of SignalScope Pro 3.0 for Mac OS 10.6 and that it is now available for download on the Mac App Store. Benjamin Schulz has announced that Oszillos-Mega-Scope, his free BPM-synced oscilloscope with support for multiple inputs, has been ported to Mac OS X. Audio Pluggers have announced the immediate availability of K-Meter for Mac OS X and Windows. Audio and video metering company DK-Technologies is offering all customers with a MSD or PT0 600 series audio meter a free software update to enable them to use the new EBU R128 Loudness Recommendation as well as the ITU BS1770/1771 and ATSC recommendations. Faber Acoustical has announced the release of version 3.0 of Electroacoustics Toolbox,now available for purchase in the Mac App Store and at FaberAcoustical.com.